The Maui towel warmer from WarmlyYours features an innovative design with an integrated, non-heating storage shelf for extra towels. With its compact design, this model delivers all of the functionality of larger units without taking up unnecessary wall-space. The hardwired electrical connection for the wall-mounted Maui will provide a streamlined look without visible wires. The 7 heated bars will deliver a heat output of 222 BTUs per hour which will not only warm your towels and bathrobes but also dry them between uses. 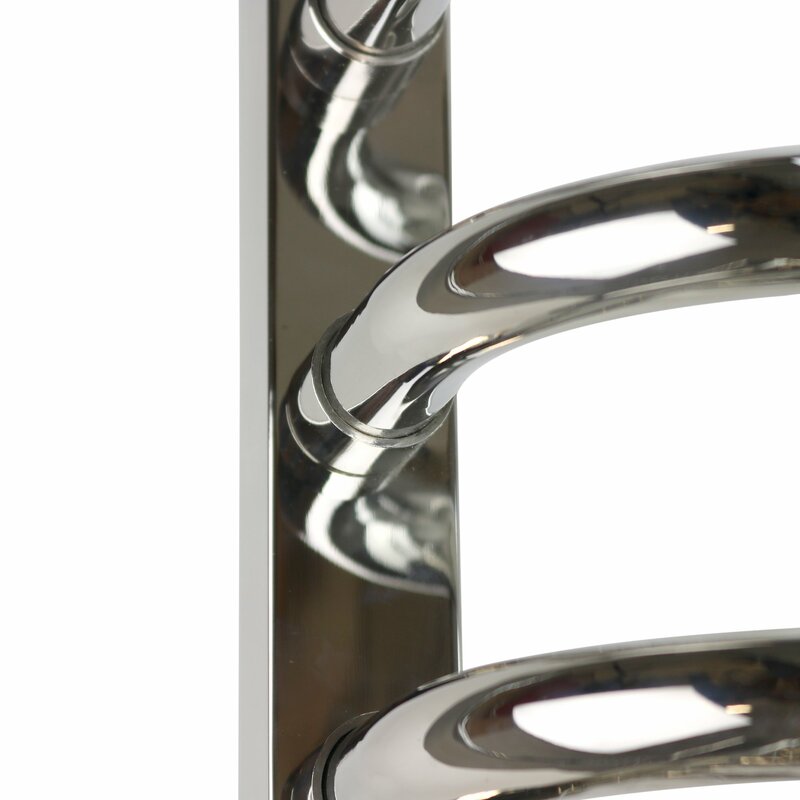 The highly polished finish, 304-stainless steel construction, and curved design of the Maui means this towel warmer will instantly fit into any contemporary design motif. This model comes with built-in TempSmart™ overheat protection to prevent the unit’s surface temperature from exceeding 149°F (65°C). Will the moisture in my bathroom cause the Towel Warmer's finish to rust or create a short? No. The Towel Warmer is not only designed to keep your towels warm and dry but also to withstand the high moisture level in your bathroom. What kind of power does the Towel Warmer require? Will I need a separate power source? WarmlyYours Towel Warmers require no more power than is generated from your standard 120V wall outlet. For hardwired Towel Warmers, all the wiring is done through the wall. A separate power source is not required; power can be pulled from the nearest available source. For plug-in towel warmers, all that is required for electric hookup is that the unit is plugged into a properly grounded outlet located within 6 feet (1.8m) of the unit. What if the Towel Warmer doesn't work when I receive it or it breaks sometime after installation? Warranty lengths vary depending on the model of the Towel Warmer, please refer to the warranty card for more information. If the Towel Warmer is defective or damaged and it was not a result of misuse or misapplication, WarmlyYours will replace the Towel Warmer. The warranty registration card can be accessed from the individual Towel Warmer's Warranty Page and must be completed and submitted online to qualify for warranty coverage. These elements can be found in our Support Section for Towel Warmers. What does the Towel Warmer include when I receive the package? Do I need additional equipment? 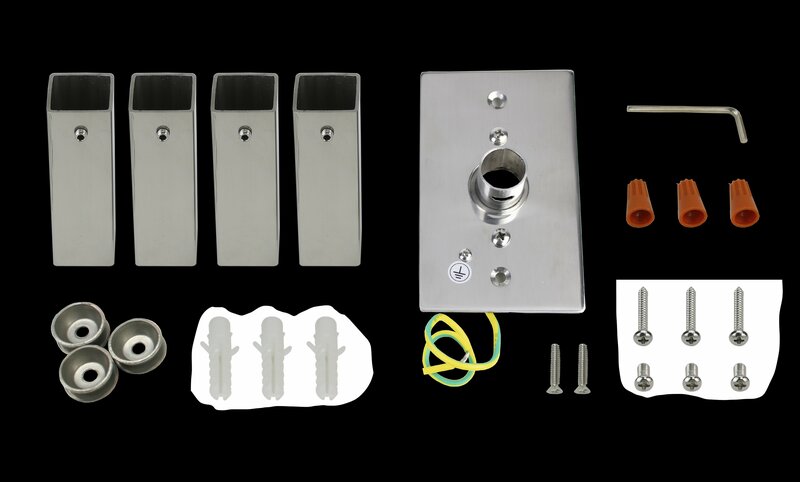 The package includes all the hardware that you will need to install the Towel Warmer. All you will need to provide are the actual tools necessary to install such as a drill and screw driver. What can I do if I order the Towel Warmer and I don't like it once I receive it? If you are unhappy with your Towel Warmer, please contact WarmlyYours Customer Service at (800) 875-5285 for assistance between the hours of 8:00am and 5:30pm CST, Monday through Friday. Please return your Towel Warmer in the original packaging. Learn more about our Return Policy. I already have a heated floor system; can a towel warmer work in tandem with my floor heating system? 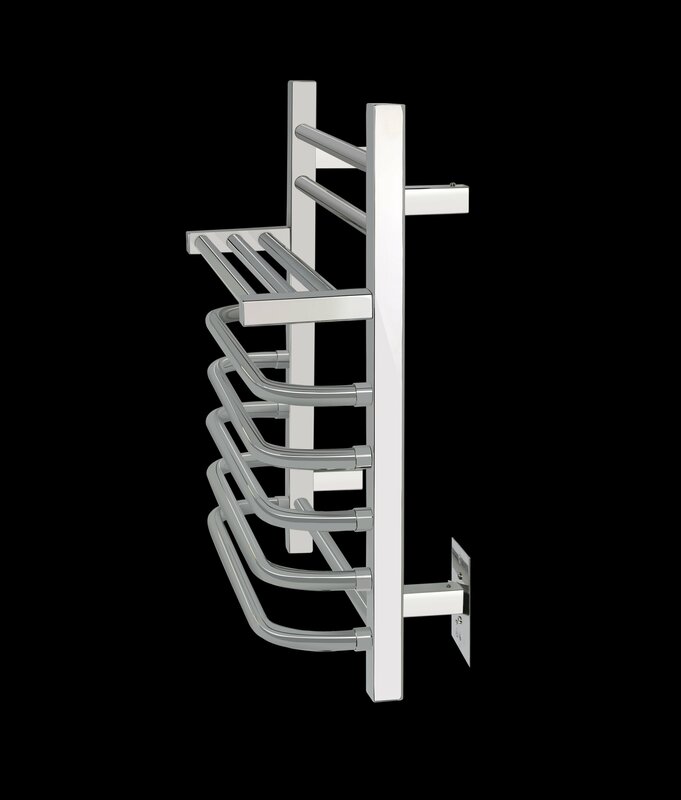 The Towel Warmer is designed as a stand alone product and will add some warmth to the room. It is, however, the perfect compliment to your floor heating system as they will work together to transform your bathroom into a spa-like retreat. How much does it cost to operate the Towel Warmer? The cost to operate your model will depend on two different variables: 1.) the wattage of the model you’ve selected. 2.) the cost of electricity in your area. A quick way to figure out the hourly operating cost is to take the cost of electricity in your area (typically measured in cents per kilowatt hour) and multiple it by the wattage of your towel warmer divided by 1000. For example, the cost to operate an Infinity Towel Warmer (a 150-watt model) in Lake Zurich, IL (where electricity costs 10.44 cents per kilowatt hour) would be less than 2 cents an hour and the formula to figure that out would look like this: $0.1044 x (150/1000) = $0.0156 per hour. How hot does the Towel Warmer actually get? Is there any possibility of damage? The Towel Warmer will heat up to between 100 and 140 degrees Fahrenheit. It will not produce sufficient heat to injure you if you touch or brush up against it, though you should still exercise caution around the device. 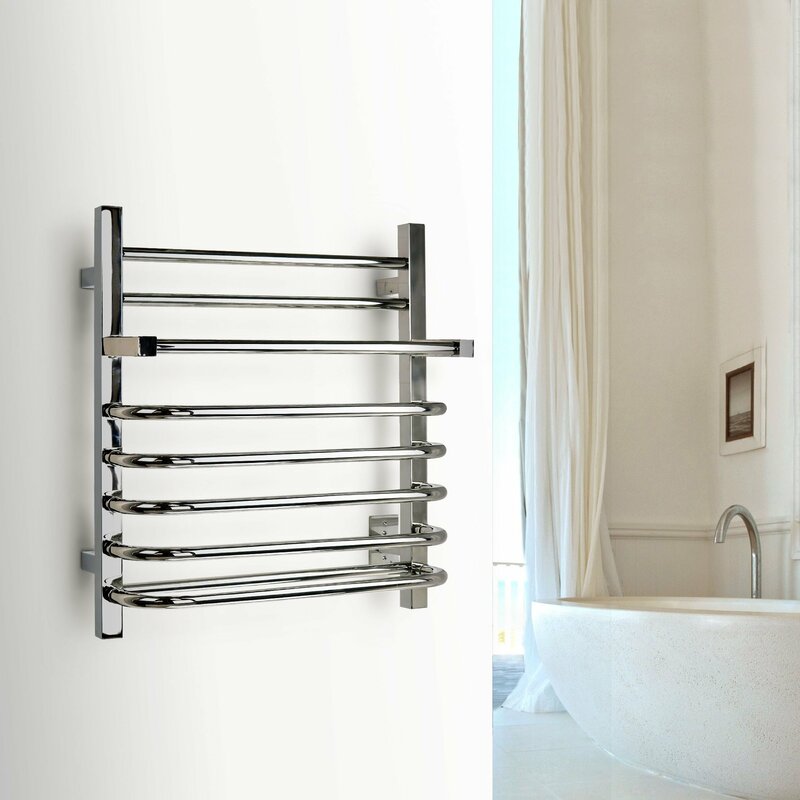 The Towel Warmers have a built-in offset from the wall (the size of the offset will depend on which model you purchased); the offset provides sufficient clearance to prevent any damage to the wall. You should also maintain a distance of four inches between the Towel Warmer and surrounding fixtures. Towel Warmer models from the Premier, Elevate or Cosmopolitan Collections come with built-in TempSmart™ overheat protection to prevent the unit’s surface temperature from exceeding 149°F (65°C). Models from the Classic Collection do not. How heavy/large are the Towel Warmers? Weights vary based on design but typically range from 9 to 29 pounds. Even larger Towel Warmers will not be a problem when attaching to the wall. As indicated in the instruction manual, you just need to make sure that at least two of the four brackets are attached to a stud. How do I use the Towel Warmer after it is installed? 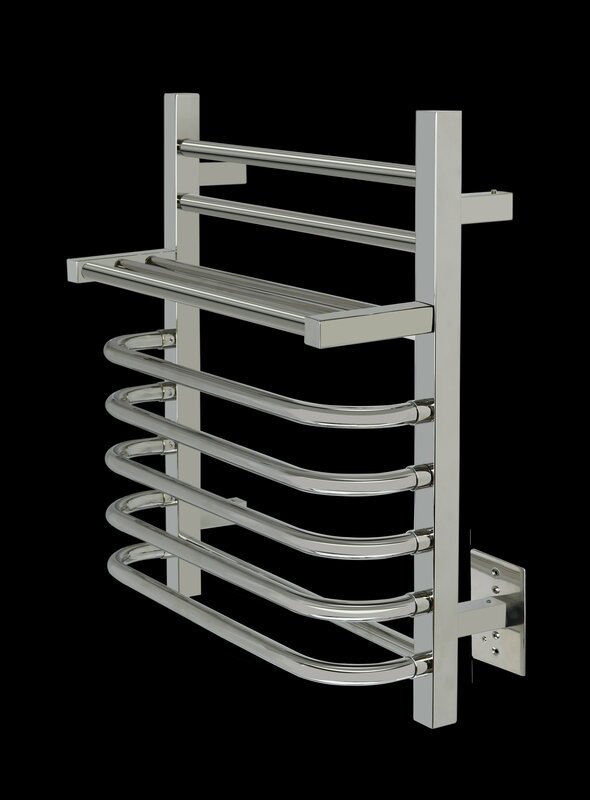 Our Towel Warmers are designed for everyday use and all of them include an integrated on/off switch. Please note that the Ibiza model from the Premier Collection includes additional built-in timer options for controlling the unit. WarmlyYours also offers a wide array of controls that can be used with your towel warmer. Depending on the control you select, you can program the Towel Warmer to your schedule or operate it remotely. Just bear in mind that the Towel Warmer is designed to gradually warm towels over the course of a day and does work best when towels are left to hang for about 3 hours. Does the Towel Warmer have an automatic shutoff function? The Towel Warmers are designed to stay on at a relatively constant temperature to keep your bathrobes and towels fresh, warm, and dry. However, should you need to turn the unit off for any reason, you can use the integrated on/off switch on the unit. If you’re using a control for your Towel Warmer, you may need to shut off the unit there as well. Towel Warmer models from the Premier, Elevate or Cosmopolitan Collections come with built-in TempSmart™ overheat protection to prevent the unit’s surface temperature from exceeding 149°F (65°C) by shutting the unit down automatically. Models from the Classic Collection do not come with this feature. Can I install the Towel Warmer myself or do I need to hire someone to do it for me? Each Towel Warmer comes with an instruction manual which fully explains how to install the device from start to finish. If you can hang a picture, you can probably install a Towel Warmer. However, for hardwired models, you will need a licensed professional who is certified to do electrical wiring for the final hook-up.